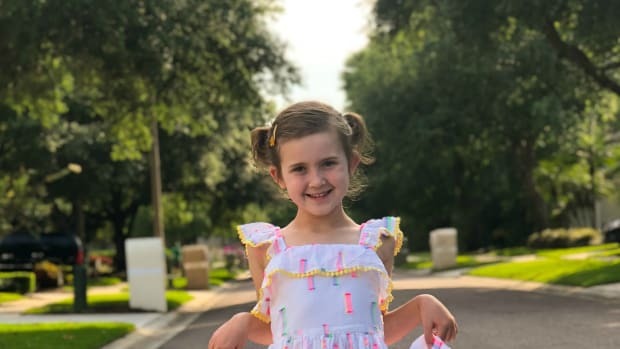 The Christmas season is in full swing and one of our favorite holiday traditions we love to share with our kids is planning a Holiday Movie Night. 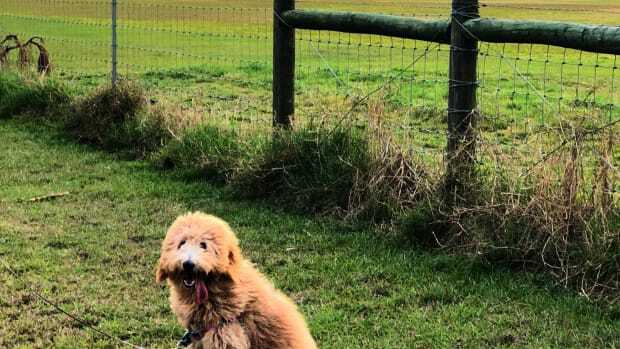 Whether it&apos;s on Christmas Eve, the first day of their holiday break, or every Friday leading up to Christmas (guilty! 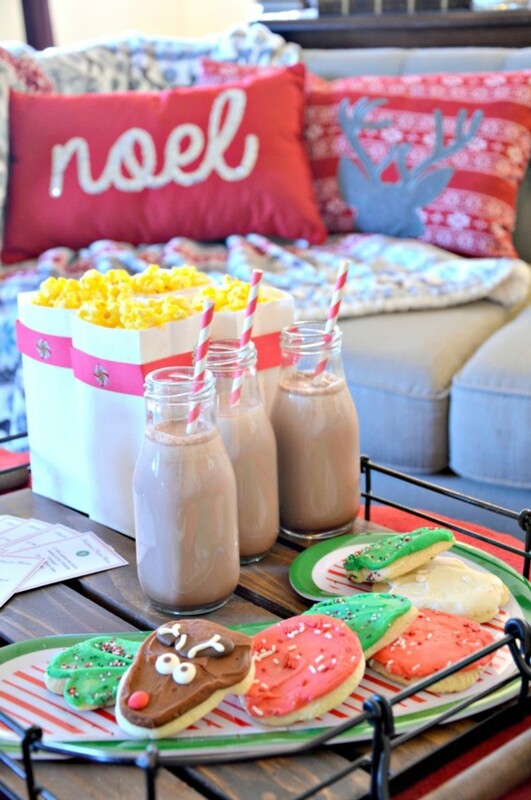 ), it&apos;s a great way to snuggle up with the family and throw a holiday movie night! 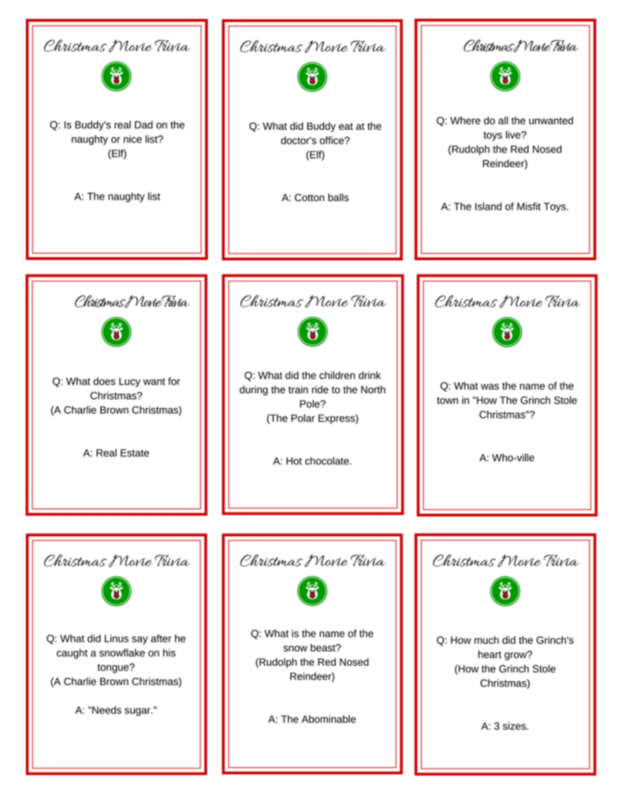 Today we&apos;re sharing how we set the scene for our Christmas Movie Party as well as some FREE Christmas Movie Trivia cards for you to enjoy quizzing family with this season. 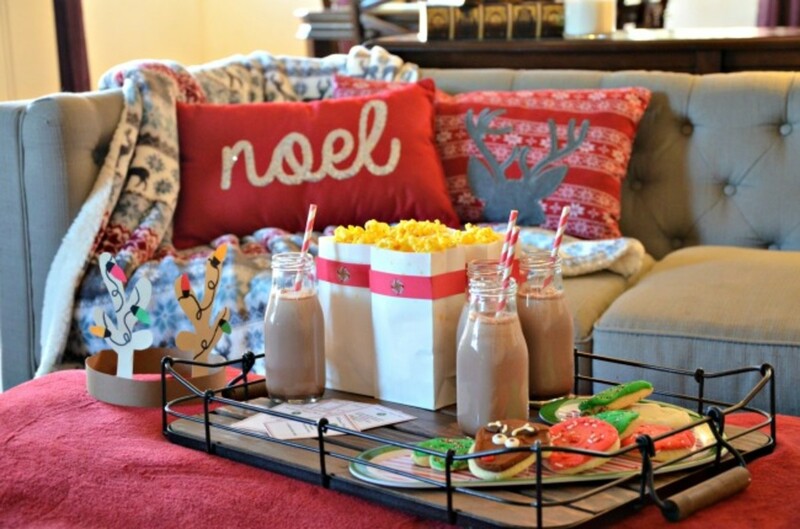 We love decorating for the holidays and a family movie night is the perfect opportunity to shop for some warm blankets and soft pillows. 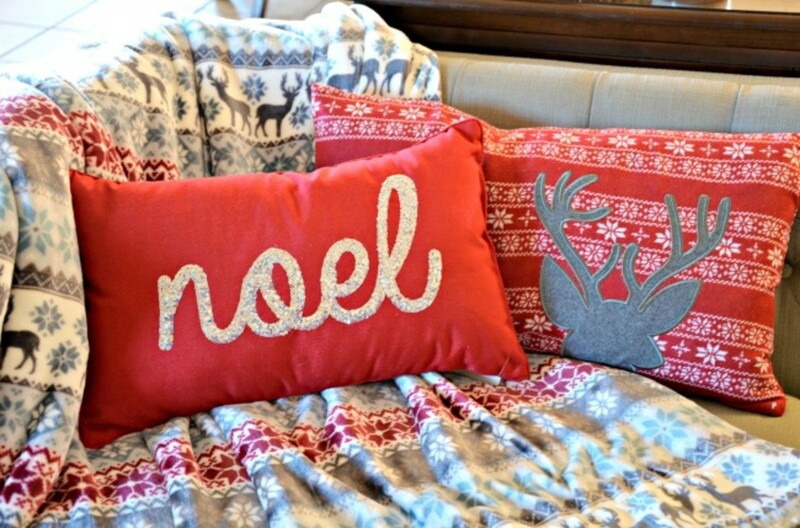 We found these perfect "noel" and reindeer pillows at HomeGoods. My couch is gray so this fits into my decor style. I love this snuggle-worthy reindeer blanket so much! 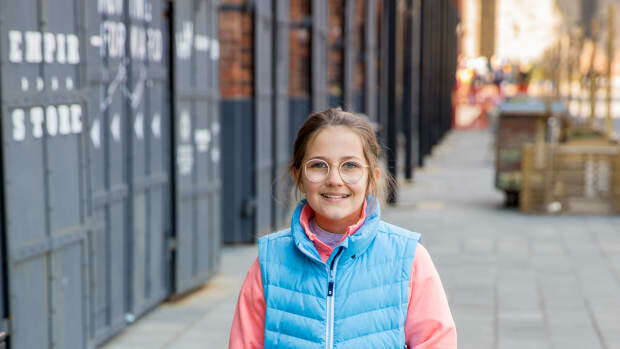 It&apos;s super soft and very cozy. I wish I could keep it out year round. I wouldn&apos;t be surprised if this stays on the couch long after Christmas has passed. 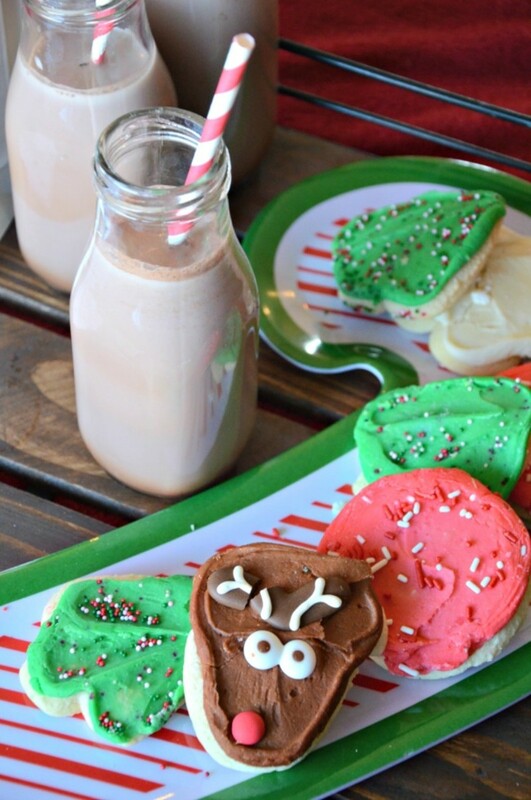 Take your Christmas movie viewing party up a notch with festive snacks. 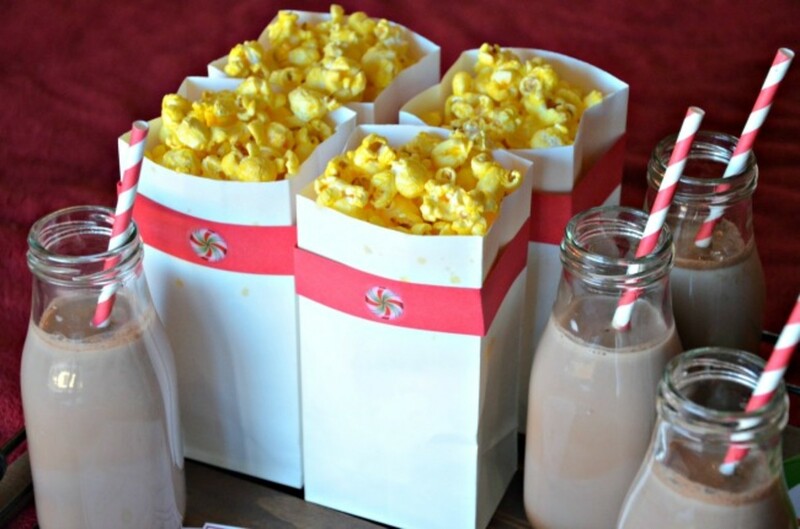 Popcorn is a must for our Christmas movie party and I served them in mini paper bags that I decorated with construction paper and stickers for a festive touch but you could always share a big bowl of popcorn family style. We served up some festive Christmas cookies on a candy cane shaped tray we found at the Dollar Tree last year but we also love this similar candy cane tray. We also had chocolate milk in mini milk jugs with candy striped straws. 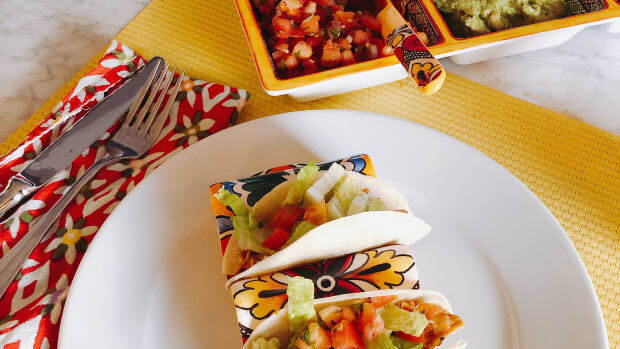 The fun doesn&apos;t have to stop after the movie ends. 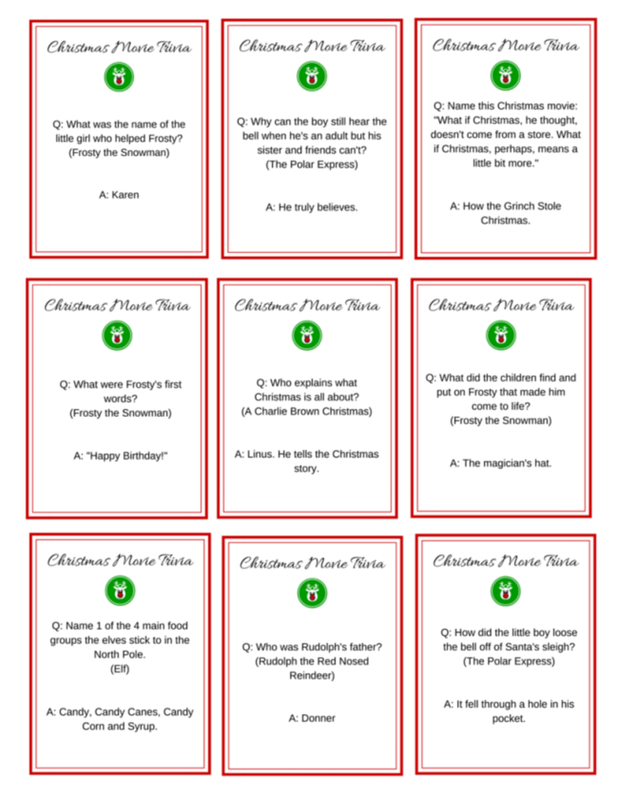 We&apos;ve got some fun Christmas Movie Trivia card free printables that you can print off and enjoy quizzing your family with during the next few weeks. These make a great after dinner game while sipping hot cocoa or break them out at your next party over some Holiday Cranberry Champagne cocktails. 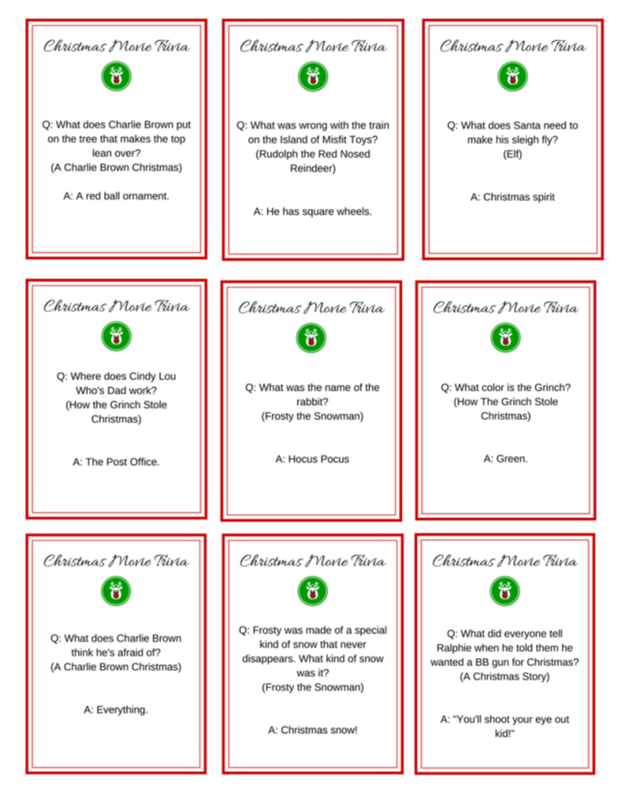 Download all 36 cards (4 pages) and have fun quizzing each other on our favorite Christmas movies: Elf, Rudolph the Red Nosed Reindeer, Frosty the Snowman, The Polar Express, A Christmas Story, How the Grinch Stole Christmas and A Charlie Brown Christmas. 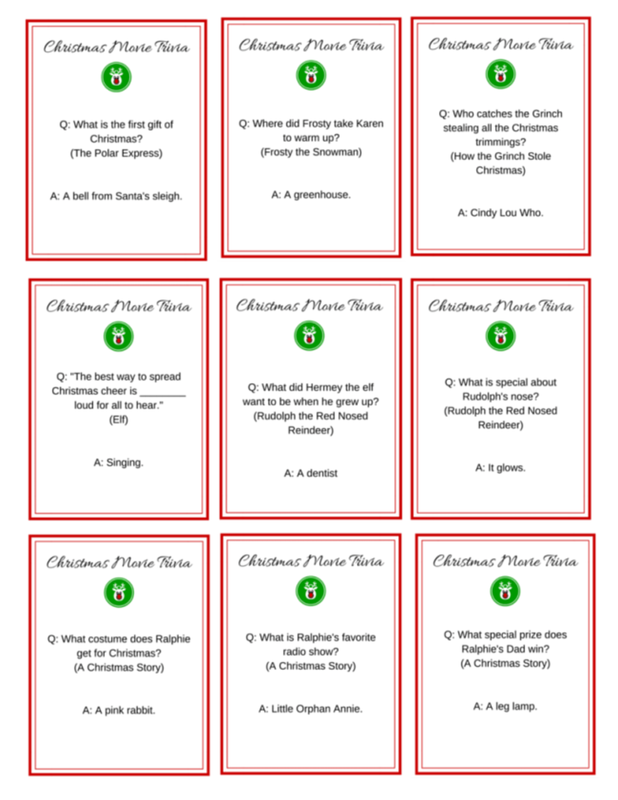 Q: "The best way to spread Christmas cheer is _______ loud for all to hear!" So, now you&apos;re all set to snuggle up and enjoy your next Christmas Movie Night! 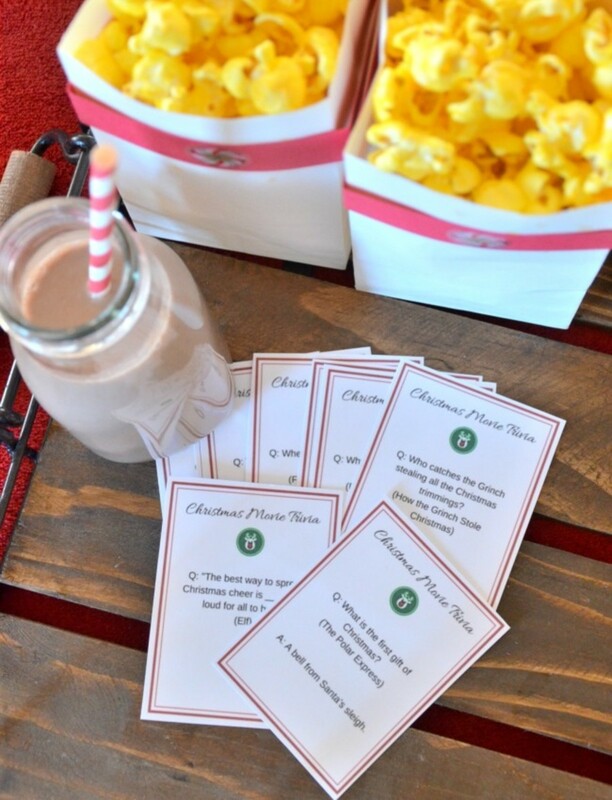 Here are some of our favorite Christmas movie recommendations: Christmas Classic Movie Giftset, Elf, A Charlie Brown Christmas, How the Grinch Stole Christmas and The Polar Express. What Christmas movie will you be watching?